Investment opportunities abound when it comes to the vended laundry industry. But planning a card- or coin-operated laundry isn't easy. At CG West, we partner with investors and walk them through the process of coin laundry site selection, equipment mix, layout and flow, amenities and financing. A successful card/coin laundry requires a solid business plan with a clear view of an area’s demographics and the right equipment mix. Rely on us to assist you in the development of a successful vended laundry. Vended laundries have evolved considerably in terms of offerings, technology and demographics served. And, as always, vended laundries are often buffered from fluctuations in the economy because clean clothes are a basic human need. When the economy is slow, there is often a greater need for self-service laundries because ownership of washers and dryers decreases. Today, vended laundries cater to full-service and self-service clientele for improved revenue, stability and profitability. Through careful differentiation of your new coin- or card-operated laundry, you can attract non-traditional customers as well as traditional self-service customers — adding to profitability. Simultaneously, through careful selection of equipment, laundries can cut utility usage, improve customer turnover and boost revenue. At CG West, our laundry development experts understand how to help you optimize your store for maximum revenue and profits. Express Laundry Centers® are turnkey, branded high-speed vended laundries that draw customers with a 60-minute self-service wash/dry/fold and high-speed Continental ExpressWash® and ExpressDry® laundry equipment. 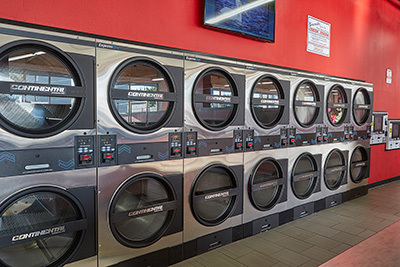 Express Laundry Center owners enjoy higher profit potential, low utility and operating costs, greater customer turnover, and ultimately, strong store resale value. Please contact us today for more information! Sometimes it makes good sense to improve existing stores using unique laundry equipment, ancillary items and services. CG West helps operators refurbish existing stores for bolstered efficiency and unique offerings to set you apart. Whether it’s drop-off dry cleaning, wash-dry-fold or delivery services, vended laundries can bolster their client base and revenue with added services. While self-service customers remain the cornerstone of business, stores with added services also cater to working professionals, large families and singles. Please contact us today for your free laundry operational analysis!